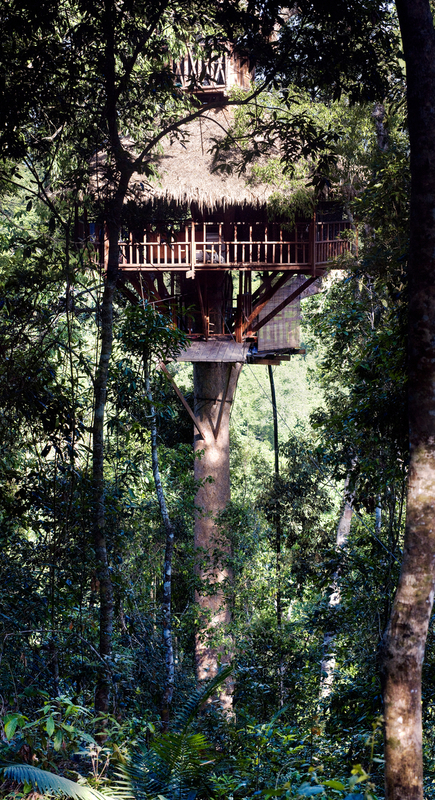 One of the Gibbon Experience tree houses, accessed only by zipline. Today is World Responsible Tourism Day. To mark the occasion, here is a story I wrote last year after travelling in Laos. This story, of which I am very proud, was one of three finalists in the Best Responsible Tourism Story category of the Australian Society of Travel Writers‘ annual Travel Journalism Awards for Excellence, announced last week. It was published in Geographical magazine in the UK. The wonderful images accompanying this story were taken by Australian photographer Paul Wager, who is based in Laos. The haunting call of the black gibbon drifts through the early morning mist. It is just after dawn in the ancient forest of the Bokeo Nature Reserve in northern Laos and I’m instantly awake. Above the trees where a family of gibbons is heralding the new day, a handful of visitors rouse from their sleep, eager for a sighting of these elusive forest-dwellers. We humans are high in the trees too; making our roost for a couple of nights in tree-houses built 20 to 40 metres above the forest floor. We’ve trekked through the forest and strapped ourselves – sometimes somewhat nervously – to ziplines, the only access to our temporary accommodation. That we’re here to see the gibbons is indisputable. That we’re part of something more important than simply observing these distant relatives is soon to become evident. The presence of people in the gibbons’ habitat is part of a wide-ranging conservation project that is changing the way villagers here look at their world. Bokeo province, in the far north-west of Laos, near the border with Myanmar and Thailand, has one of the last remaining populations of Black-cheeked crested gibbons in Laos – and of this particular sub-species, in the world. 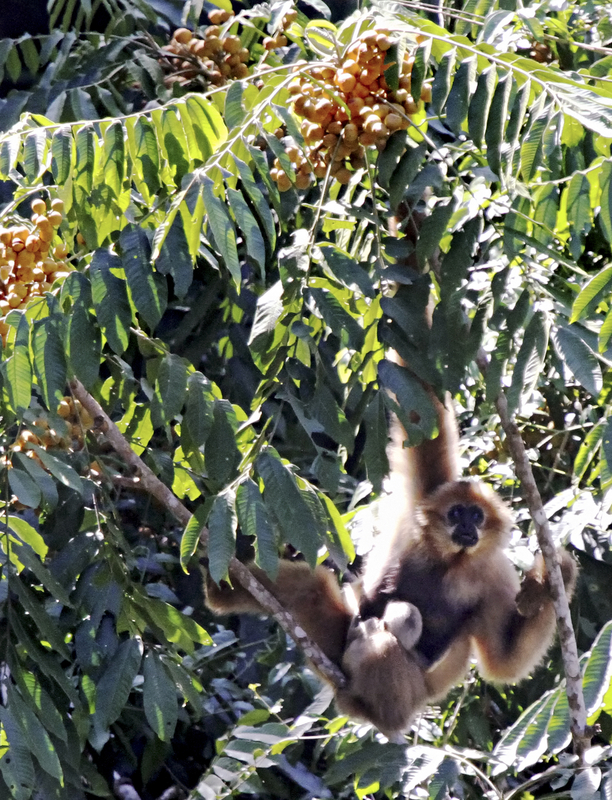 The Gibbon Experience, a three-day excursion into a protected habitat in the Nam Kan Provincial Protected Forest, is the only chance to see or hear this endangered lesser ape. From a village at the edge of the forest, our small group has trekked for about an hour with local guides and the founder of the Gibbon Experience, Jef Reumaux. Reumaux, a French national, has worked in the forest for more than a decade, developing a strategy to bring tourists into the forest as a way of funding projects to give villagers an alternative income and remove the need for slash-and-burn farming, poaching and logging. The founder of the Gibbon Experience, Jef Reumaux, riding one of his zip lines. A former university mathematics teacher in the Laotian capital, Vientiane, Reumaux spent a number of years doing survey work in remote areas of Laos, and in 1997 learned of a population of Nomascus concolor lu (Laotian Black Gibbons). Once believed extinct, the gibbons were living in the range where seven tree-houses now nest. Ten families of gibbons, each of about five individuals, are known to range between the tree-houses. “There are also about 35 individuals on the other side of the range, a little less than a total of 100 we know of, and we suspect that there are another 100, from the stories we hear from rangers in the forest,” says Reumaux. This, he says, is a sub-species that exists only in one other spot in the world, in China. “They are considered both the most endangered gibbons in Laos, but at the same time the healthiest population in Laos, because there are no predators,” he says. A female gibbon with a baby at the Gibbon Experience. Photograph courtesy Jef Reumaux. After several years of negotiation with the Lao government, the Bokeo Nature Reserve was established in 2004 by the Lao Forestry Authorities and Reumaux’s conservation-based eco-tourism company Animo. The reserve covers 123,000 hectares of mix-deciduous forest in a mountainous region that borders the Nam Ha Protected Area, ranging up to 1500m in elevation. The Gibbon Experience is run by Animo, with a mandate from the Laos government to provide local people with a way to live sustainably while conserving the rich diversity of the Bokeo Nature Reserve, with its birdlife, insects, mammals including populations of bears and tigers, as well as migrating populations of elephants and buffalo. By the end of 2004, the tree-house project was underway to provide a source of funding for the conservation work. 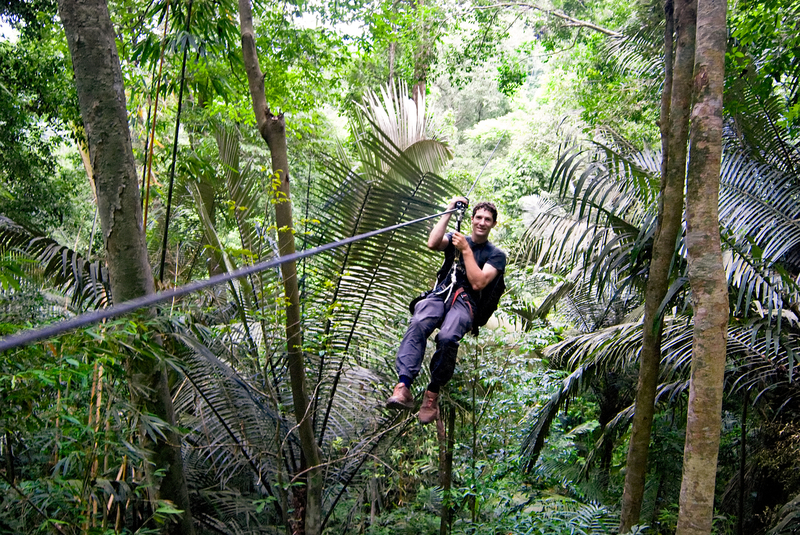 A network of ziplines links the tree-houses, with visitors “flying” over the forest with local guides, to watch the wildlife and stay overnight in the treetop canopy. While it is an extraordinary, exhilarating experience, Reumaux is careful to ensure it doesn’t become a full-blown tourist attraction. There has been no advertising and the visitor numbers are strictly limited. He describes his project as “a way to deal with politics without dealing with politics”. “We came with no political intention, just ecological intention,” he says. “It is very significant, what we are doing. What does it mean in terms of human development and economics? The environment is the first thing to save, but it will only work if people believe in it. The human intrusion into the gibbons’ habitat helps raise awareness about the endangered status of these lesser apes, and show Lao people how much they have to gain by caring about wildlife and the environment. Income from the limited number of tourists – the tree-houses accommodate a maximum of 25 people, but the reality is much fewer – is reinvested to protect the forest. Reumaux says the success of the Gibbon Experience has proved forest conservation can be achieved by a local team without relying on handouts from governments or other countries. “People can now really see that conservation can be profitable – and that’s the only message that people understand. They need to learn that they can make much more money by protecting the forest. “Conservation is an economic model on its own; it doesn’t need to be backed by government. At a village, district and provincial level, the Gibbon Experience is accepted because it is fully sustainable and people are making money out of it. There are two major protection projects for the forest –prevention of poaching and illegal logging, and the move away from traditional slash-and-burn agriculture techniques. While slash-and-burn cultivation still exists to grow rice in the hills, even inside Bokeo Nature Reserve, villagers are learning that they can make a “non-destructive” living from their unique environment, by protecting the forest and farming only on lower altitude flatlands. Reumaux says slash-and-burn is now confined to the south of the reserve, in a buffer zone between the main road and the primary forest further into the reserve. “We are helping villagers to follow the official agricultural transition plan which aims at replacing all slash-and-burn harvests with irrigated paddy fields, throughout Laos,” he says, adding that Animo provides villages in the Bokeo Nature Reserve with free use of a tractor to speed up the transition. 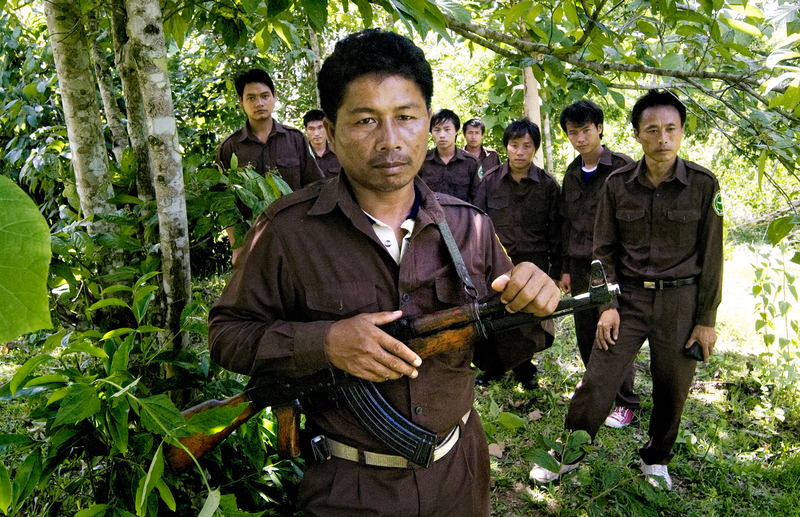 As well as employing 80 people, the Gibbon Experience also funds a team of 20 “forest guards” – the only ones in Lao National Parks – who patrol about a third of the reserve’s area to protect it against poachers and illegal loggers. The armed guards report directly to the provincial forestry authorities, and are entitled to confiscate weapons, fine offenders and take them to the police. Forest guards stockpile seized illegal guns, logging equipment and chainsaws. Guns are burned every night in a “rifle pyre” after being seized, an act that’s as much about symbolism as destruction. Composed of members from various tribal groups, the forest guards also record wildlife sightings and movements. Reumaux believes only local people “with a proper mandate” are able to truly monitor and protect the forest and says the guards are ambassadors for their communities. Twenty-six-year-old Kham Yuan tew Sien, from the Hmong people in Luang Nam Tha province, on the other side of the national park, is one of a new breed of educated forestry workers taking up the role of forest guards. After completing a five-year Bachelor of Forestry degree in Vientiane, he went to work for a logging company. “He was one of the best students in his class, and after two years working for the loggers, he came to me and said he wanted to help protect the forest,” says Reumaux with some satisfaction. Kham Yuan tew Sien is not an isolated case; he is one of three former forestry workers who have worked for Animo, and one of two who still do. A plantation forest is also part of the broader plan. “We can fight against local logging but people will always need wood and there will always be logging,” says Reumaux. A nursery on the outskirts of the border town of Houayxai holds more than 15,000 plants – teak, redwood, rosewood – as reafforestation is undertaken around the national park. The aim, says Reumaux, is to provide “something to log” in a decade’s time, without encroaching on the ancient forest. A thousand families in 15 villages around the conservation park receive a portion of land, and do the clearing and planting of two to three hectares of plantation forest. From an initial investment of one euro per hectare, the forest conservation and canopy visits generate as much income every year as a logging company would just once, says Reumaux. We walk through the forest, listening to birdcalls, spying vivid green geckos, butterflies, delicate ferns and fungi, and the fresh tracks of an Asiatic black bear. A hornbill calls. In the silence, but for the sound of our feet, there’s a sense of how ancient this forest is. At the first zipline, 80 metres long, nerves are stretched as taut as the cable. We’ll travel on 15 “zips” over our three day stay, the longest reaching 300 metres, across a wide valley and eliciting involuntary shrieks from the novices among us. The guides handle each as if they were born to it. Other ziplines have been built across the rice fields to make it easier for villagers to work. 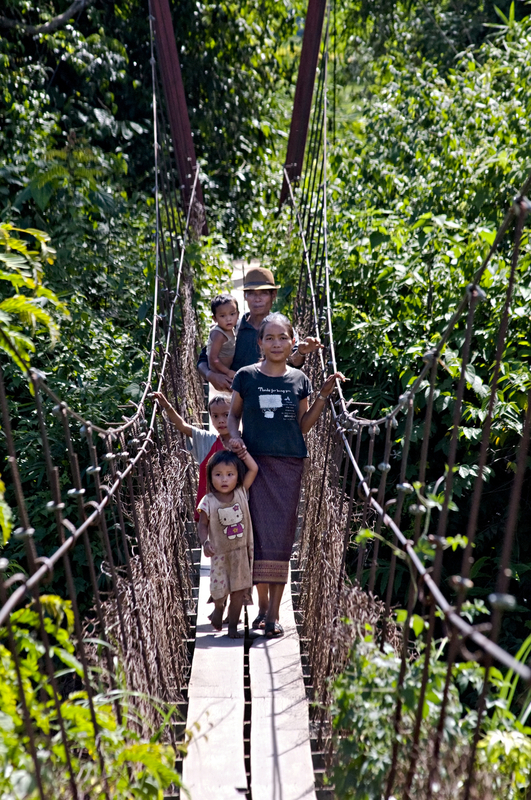 A family crossing a suspension bridge built and paid for by the Gibbon Experience. The tree-houses are built without nails, all bound to the trees with steel cable that is renewed every two years. The replaced cable is later used to build suspended bridges in the villages, instead of the traditional rattan bridge which need replacing every six months. In our thatched-roof aerie, Reumaux lets silence do its own work. His belief that a change of perspective – for visitors and locals – is all-important in conservation work rings true. 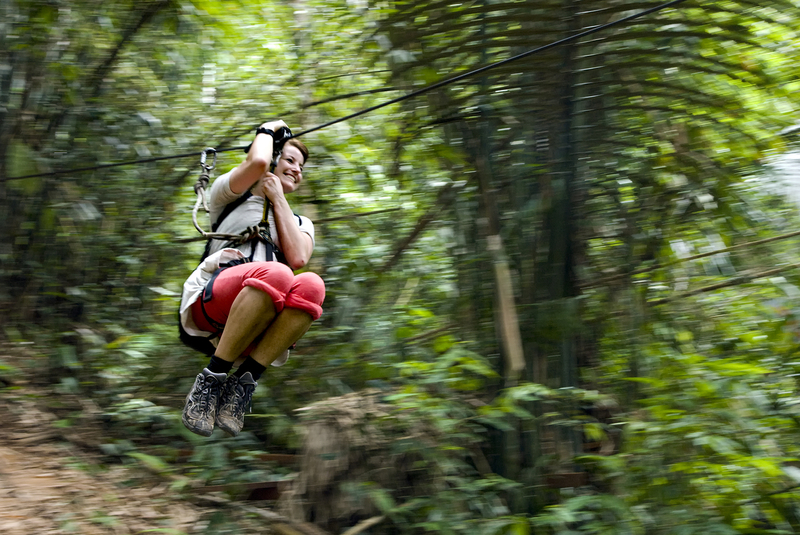 High in the canopy, our own “gibbon experience” is limited to that eerie dawn song. We’re staying in a tree-house that – today, at least – is too far from the gibbons for anything more than distance glimpses as they play in the trees. “About 60 per cent of our guests see gibbons, but everyone hears them,” says Reumaux. It’s enough. Once heard, the song of the gibbon will stay with you forever. I love this whole concept, Lee, of showing the villagers how they can generate a good income without destroying their environment. Great work! And great article. Yes, Penny – quite an amazing man, and a wonderful concept. It’s incredible what people with true vision can achieve. Wow, check out the video on this site, which reminded me just how terrifyingly high the ziplines at the Gibbon Experience were. Thanks to this blogger of all things French for sharing!